BBA Professional is a 3-year undergraduate course spread over a span of 6 semesters. The minimum eligibility for the course is 12th Class i.e. a candidate must have cleared his 12th class to be eligible for applying BBA. The candidate must have passed the 12th from recognized board with a minimum of 50% marks and a student from any steam can apply for the program. The course also comprises variants like BBS, BBM, and BMS. Other than 50% marks criteria, there are several entrance examinations for admission to the BBA Course. BBA Professional is a course that has become the first choice of all the students nowadays. Every student is looking forward to making his career in management and business administration and BBA is the best start for it. The basic aim of the course is to impart management education to the students and the course is aimed at providing proper training to the students about the business administration. The course also helps students in improving their communication skills and prepares them for the management profession. The average tuition fee charged for the course in India ranges between INR 1 to 5 lacs for a span of 3 years. A student pursuing BBA can be considered for various job roles like Accountant, Financial analyst, Business development executives, Marketing executives, Project Planner, Production Supervisor, Business Administrator, etc. The average monthly salary offered to BBA Professional graduates ranges from INR 10,000 to 20,000 and it goes on increasing with the experience of the candidates. 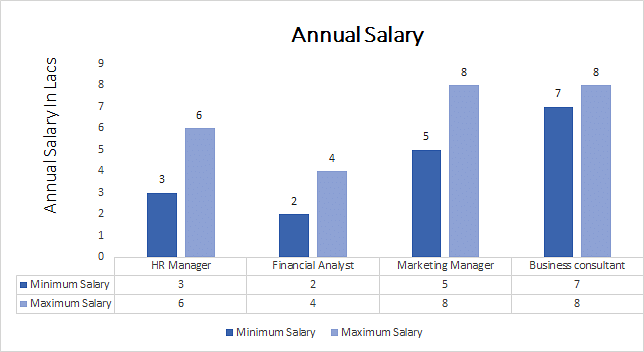 Average Starting Salary INR 10,000 – 20,000 per month. Top Recruiting Companies ICICI, IBM, Axis bank, Nestle, Accenture, SBI Life Insurance, HCL, Yes Bank, etc. Job Positions Accountant, Financial analyst, Business development executives, Marketing executives, Project Planner, Production Supervisor, Business Administrator, etc. BBA Professional: What is it all about? BBA Professional is a course that aims at providing basic management education to the students. In an age, when everyone wants to learn business skills, the course prepares the students with business tactics that will help them in future. The course provides both theoretical and practical knowledge of various business areas like Finance, marketing, HR, Accounting, etc. The course opens the students to the business world and provides them a larger perspective. BBA Professional course not only provides you the bookish knowledge but also imparts practical knowledge of the business practices. The course being a professional course involves professional subjects like accountancy and finance. In the course, the student has a choice to select a professional subject of his choice, for example, International Business, Finance, HR, etc. It is helpful for all the students who want to make their career in business administration and is also an advantage for those who wish to pursue MBA after BBA Professional course, as it aware you about the areas to be covered in MBA. A candidate must have passed 10+2 examination with minimum 50% marks from a recognized university to be eligible to apply for the course. However, the eligibility conditions may vary according to different institutions. SET- SET i.e. Symbiosis Entrance Test is an entrance test conducted by Symbiosis International University for admissions in various undergraduate courses including BBA. AIMA UGAT- It is a national level Under Graduate Aptitude Test (UGAT) conducted by All India Management Association (AIMA) for admissions to various undergraduate courses. There are numerous opportunities for a BBA Professional graduate. A candidate pursuing the course can work in a bank, business houses, educational institutions, marketing organisations, business firms etc. A BBA graduate can be a financial analyst, HR manager, Finance manager, Marketing Manager, Business consultant and much more. As the course prepares a student professionally, so it basically leads them to professional positions.